August 10, 2011 Dan O.
Oh more pirates, and so much more sweaty dudes. Welcome back to the crazy and wild adventures of Capt. 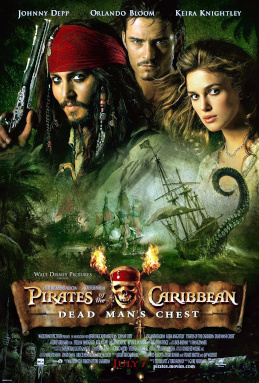 Jack Sparrow (Johnny Depp), young Will Turner (Orlando Bloom) and headstrong beauty Elizabeth Swann (Keira Knightley). As Sparrow works his way out of a blood debt with the ghostly Davey Jones (Bill Nighy), he also attempts to avoid eternal damnation. After seeing the first one, I realized how much I loved this whole trilogy so I’m going to give it all a try. Surprisingly this one holds up well to the original, which in a way seemed hard to do. Like the first, director Gore Verbinski knows how to keep a film entertaining even if there is all this havoc going on. There’s a lot more subplots here, sword fights, pirates, and just more everything but I still had a great time through the whole film. Nothing new really happens here that really wasn’t done in the first one, but that doesn’t matter cause Verbinski knows how to make a fun blockbuster even if it is over-stuffed at points. Let’s not also forget to mention that this is so much funnier, in my opinion, than the first probably because the screen-writers wanted to make more people laugh in between all the havoc. The main problem with this sequel, which other people had was the fact that there was almost way too much going on to the point where you really didn’t have a compelling story-line. I liked the whole Davy Jones angle but then you got Elizabeth and Will’s love, then Jack trying to find the key, then Will finding his dad, then all this havoc back in the home-land with the government, and then there’s probably so much more I’m missing. Just by me listing all those sub-plots that are within this film you can already tell that there is too much going on here but the fact of the matter is, is that I had fun even with all these stories going on at once. As with all the Pirates films I had a great time with the cast. Johnny Depp is still amazing and his entertaining self as Captain Jack Sparrow. The whole film you see Sparrow basically being a goof throughout the whole thing and almost every time, Depp’s delivery just got me laughing and it almost seems like Depp can practically play this character in his sleep. Orlando Bloom is good as Will Turner and actually has a lot of emotional weight with his story; Keira Knightley is also OK as Elizabeth Swann; and Bill Nighy really is amazing as the evil, Davey Jones. The CGI that they used for him just looks so perfect and they honestly couldn’t have done it any better because every emotion Nighy has, shows up on Davey Jones’ face and works. Consensus: This one may be a little too all-over-the-place for some to handle, but the action is still fun, the performances are still good, and you still will probably feel exhausted when this film is over, but in a good way. They are a bit confusing here and there, but they are still loads and loads of swashbuckling fun I must say. I don’t think the first one (Curse of the Black Pearl) was to confusing, I thought they got that one spot on and is by far the most enjoyable of all the Pirates films. I actually enjoyed Dead Man’s Chest a lot more than the original film, which I found a little weird. I thought the addition of the Kraken was brilliant, as were the Davy Jones effects on Bill Nighy. If there was one part i felt was underdeveloped, it was the Will/Jack/Elizabeth “love” triangle… moments of that elevated this film to new heights, but there simply wasn’t enough of it. Don’t get me started on the third film, though. Haven’t seen the 4th. The third one is alright from what I remember but this one is very good and although it’s not as good as the first one, there are moments that just make this awesome especially the love “triangle”. I love the Pirates franchise and did like this, but it was just a bit to intense. my brain was fried after trying to follow all the sub plots. Saying that you can just sit back and take in the Captain Jack quirkiness which is more than enjoyable in itself. Curse of the Black Pearl didn’t even feel like a movie about Pirates, more like Indiana Jones mixed with vampires or zombies or something… but it’s a looong time since I saw it, I remember very little about it.